Our charming little fairies are now in the company of the wind fairies and they want to take advantage of that to go far, far where there is a place full of stars. -Look, says Elsa, the beautiful star that shines so brightly. -If you are speaking about Venus, it isn’t a star but it’s a planet, explains Fairy Brise. Whether or not the sky is full of stars, I enjoy watching this gorgeous planet disguised as a star. But she is so far, very far. We cannot reach it. - I hear you talking to me each night. I want to get to know you better. Why don’t you invite me to join you? -Brise can’t believe her ears. How? Venus is speaking to her? But why now? Is it really her? -But what did you do to come right here, you are so far? -Look at the moonbeam which sparkles up to your feet. I hang on and I let myself slide on it like a slide. Look at me. Your look is the light which guides me toward you. But don’t look away or else the moonbeam will disappear and I can no longer slide toward you, explains Venus. Then the fairies see Venus beginning to slide down toward them. She is already half-way when Brise enthusiastically invites all the fairies to join Venus with her. -A star that is coming to us. And, not a mere one at that. Venus! Our fairies clap. -You are so bright, remarks Elsa. -Thank you my friends, but above all, I represent all which is important in this universe: love, responds Venus. I look like a precious shiny object filled with gold. -What is love? Can you explain it to us? Asks Bourrasque. -Love is in the heart. To love, comes from the heart. To love means to shine, it is beauty. It’s…but you don’t know what it is? Asks Venus surprised. -To love means you appreciate the flowers, the blue sky, the birds, the softness of the wind. It gives happiness, joy, makes people happy and makes them feel the most important, explains the moon which shines its rays of light throughout the atmosphere. -So we are lucky because we love flowers, the blue sky, the night, the wind, the moon the stars, the trees, the sun, the rivers, but also we love making other people around us happy. To laugh, to have fun, to please, be of service, says Elsa suddenly. -Therefore, Venus, you represent love. What a beautiful name! And above all, thanks to the moon and its beams, you were able to come to us. We know you now and you know us as well. You know that we exist, who we are. What joy in our fairy hearts. Thus, this night is the most beautiful that has ever existed. Hearts are joyous and love is here! 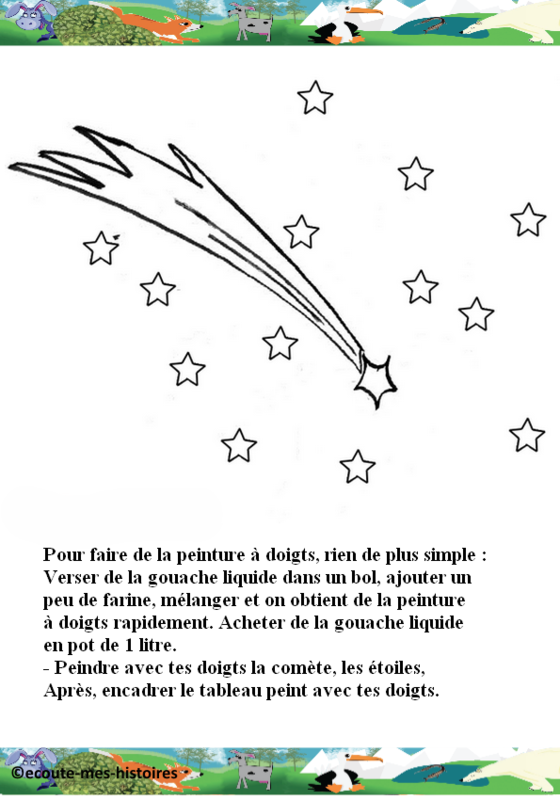 Manual activity: paint the comet with your fingers. Finger painting is so simple! Pour the watercolour paint into a bowl, add some flour, stir and instantly obtain finger paint. Buy watercolour paint in 1 litre bottles. Paint the comet and the stars with your fingers; Then draw a frame with your fingers.